From different social circles, they are worlds apart but still stuck together. What happens when people reveal their true characters? A book that shows our inner struggles and our fight with our basest desires, Doctor Kesi weaves a compelling story with a false encounter at its core. This was a difficult book to rate because I had numerous emotions assail me while reading the book. The cover is innovative and shows Lord Buddha with blood splatter and a bullet which instantly engaged my attention and intrigued me enough to check this book out. I asked myself that question, "What does the figure of peace, Buddha have to do with blood and bullets?" The plot is a novel idea which has been planned admirably by the author. The writing style needs polish because I did feel confused several times in the book and had to go back and reread that part again to understand what the author wanted to say! This can be avoided with a better handle on the language and with care to keep the sentences short, clear and avoid ambiguity. We are taken in a dark world with hidden motives, political gambles, spinelessness and a lack of morale that shocks as well dares the reader to see the true ugliness of the world behind all its shine and polish. The story is medium paced but keeps you engaged enough till the end. I didn't get completely sucked in the story but did enjoy the book. The characterization is admirable but could have been better. The author has done his research and it shows in the book. His handling of the Maoist community handling is noteworthy but he should also understand that the readers don't know that they have commanders and cadres which, at first, confused me to think that Sambhu was in the police! The other characters are given their due share of spotlight but I wont say much about them. Read the book to find out more. Overall, this is a different kind of a book which deals with a new concept and a story that will entertain readers looking for a story based on current issues. 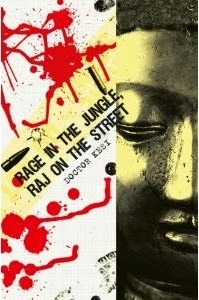 I give Rage in the Jungle, Raj on the Street 4 out of 5 and recommend it to readers looking to read some quality literature based on issues that presently mar our society. Doctor Kesi is a very promising new author and I hope to read more from him in the future.